What does the scarlet A do for Hester Prynne? By deepening her emotional sympathy and by allowing her to liberate her thinking from Puritan orthodoxy, Hester Prynne’s scarlet letter, meant to exclude her from the community, functions ironically as the agent of her inclusion. The Scarlet Letter, by Nathaniel Hawthorne, 1850. When critics focus on the red A that Hester Prynne wears in The Scarlet Letter, they often concentrate on ferreting out the symbol’s complex and contradictory meanings. This lesson takes another tack: it explores not the letter’s meanings but rather an aspect of its function. It is relatively easy to say what the “token of her shame” does to Hester. It isolates her from her neighbors; it intensifies her guilt; it kills her spirit, robs her of her beauty, subjects her to insult and ridicule, and inflicts deep pain and anguish. In light of all that, it is a challenge to say what the letter does for her. This lesson argues that the letter, meant to exclude her from the Puritan community, functions ironically as the agent of her inclusion. It makes this case through a close reading of three brief passages. The first illustrates how the wearing of the letter deepens Hester’s emotional understanding. It allows her to sense moral weaknesses and failings beneath the outwardly unblemished virtue of her neighbors and teaches her that her sinfulness is not unique. The second illustrates how her punishment deepens her intellectual understanding. The isolation the letter imposes upon her gives her the critical perspective to liberate herself from the oppressive orthodoxy of Puritan New England and provides a hopeful, optimistic vision the transcends the grim theology of Boston’s magistrates and divines. The third passage shows how these emotional and intellectual qualities combine to make her, upon returning to her remote cottage, the community’s sought-after counselor and comforter. Not only can she lend a sympathetic ear to the woes of her neighbors, particularly women, but she can also instill hope with a vision of a brighter future. By forcing her to contemplate daily the reality of sin and by leading her to question the harsh morality of Puritanism, the scarlet letter bestows upon her the emotional and intellectual depth that brings Boston’s troubled and perplexed to her door. This lesson is divided into two parts, both accessible below. The teacher’s guide includes a background note, an exercise that allows students to explore vocabulary in context, and the text analysis with answers to the close reading questions. The student version, an interactive PDF, includes all of the above, except for the answers to the close reading questions. For symbol hunters, reading Nathaniel Hawthorne’s novels and short stories is like going on a grand safari. On almost every page a big, inviting target lumbers into view. What does the pink ribbon mean in “Young Goodman Brown,” or the plant and the fountain in “Rappaccini’s Daughter,” or Georgiana’s blemish in “The Birthmark”? 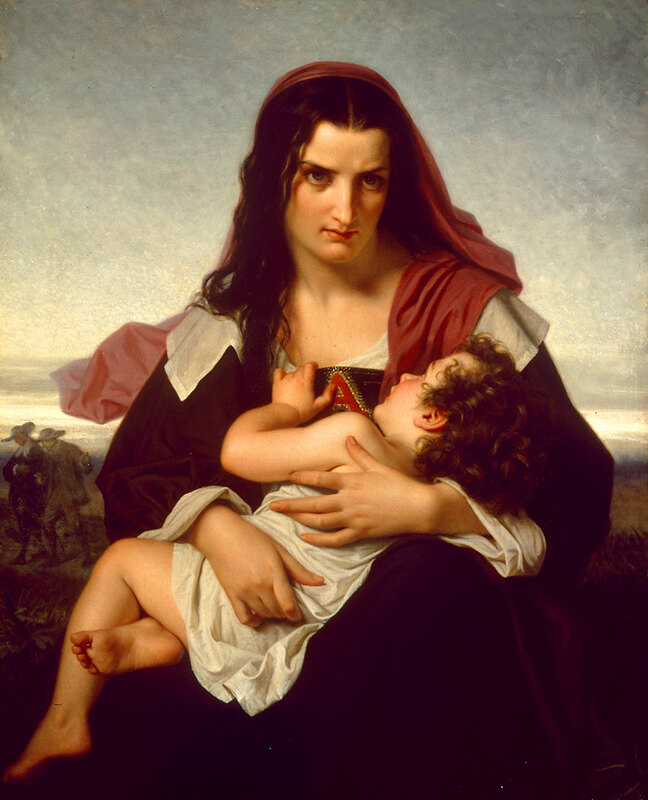 The biggest Hawthorne trophy is that splendid red A Hester Prynne wears on her dress in The Scarlet Letter. Critics have devoted a lot of time and ink to ferreting out all the meanings of that complex and contradictory symbol. Perhaps your teacher has asked you to join that hunt. Here’s a hint: Hawthorne suggests virtually all of the A’s meanings early in the novel when he introduces Hester as she emerges from jail. In this lesson we are not going to concentrate on what the A means. Rather, we are going to consider what it does. Clearly, it does a lot to Hester. It exiles her and Pearl to a lonely existence in a remote cottage. It subjects her to malice, scorn, and insult. In a thousand ways, the narrator tells us, “did she feel the innumerable throbs of anguish that had been so cunningly contrived for her by the undying, ever-active sentence of the Puritan tribunal.” The “red-hot brand” consumes the joy and grace of her personality and even works a “sad transformation” on her beauty. But does the A doing anything for Hester? Actually, it does. Hester could relieve some of the suffering inflicted by the wearing of the A simply by leaving Boston. No one is forcing her to stay. Yet she remains, even though she knows that she will be the go-to example every time the topics of shame, guilt, and sin come up, as they often did in Puritan Boston. She stays, the narrator says, because an “irresistible” feeling binds her to the “spot where… [a] great… event has given the color to” her life. Moreover, “there dwelt” in Boston “one with whom she deemed herself connected in a union.” While these may have been her real reasons for remaining, she, according to the narrator, half deludes herself into thinking that by enduring “the torture of her daily shame,” she will “at length purge her soul.” For whatever reasons, Hester feels bound to the scene of her sin. After Dimmesdale and Chillingworth die, she does leave, only to return years later to take up again “her long-forsaken shame.” She moves back into her cottage, but now, instead of being isolated there, she is embraced by the community as a counsellor and comforter to the sorrowful and perplexed. Ironically, it is the scarlet A, the symbol of her exclusion, that enables her to fill that role. Just how it does that is the subject of this lesson. 1. To what is the narrator referring when he mentions “the little world” with which Hester is “outwardly connected”? He is referring to the Puritan community. 2. “Walking to and fro, with those lonely footsteps, in the little world with which she was outwardly connected” — what do those lines suggest about Hester and about her relationship to the Puritan community? The pacing “to and fro” suggests she is given to deep, perhaps compulsive, thought. The “lonely footsteps” suggest the isolation in which she lives. That she is only “outwardly” connected to the Puritan community suggests that inwardly, ie. emotionally and intellectually, she is alienated from it. As we shall see in the analysis of excerpt 3, all of these attributes — the deep thinking, the isolation, and the alienation — will, in the end, function ironically to integrate her into Puritan Boston. 3. With what “new sense” does the scarlet letter endow Hester? The sense to detect sin in the hearts of others. 4. How does the narrator use the word “sympathetic”? It is important for students to understand that the narrator uses “sympathetic” not in the colloquial sense of feeling pity for someone but rather in the sense of feeling with someone, sharing an emotional and intellectual bond. 5. What alternate explanations does the narrator offer to account for Hester’s new awareness of the sins of others? It is either the work of Satan designed to undermine Hester’s faith, or she senses that other people are sinners, too, because they, in fact, are. 6. We can restate the explanations the narrator poses as a question: Is Hester’s sense that other people are sinners like herself a false perception planted in her mind by Satan, or is it true? How does Hester answer that question? She is not sure. She wants to attribute her intimations to the devil — “What evil thing is at hand?” — but, as we see in the last sentence, she is struggling with the idea that others are really as guilty as she is. How does Hawthorne the author and we the readers answer that question? Both Hawthorne and we know that other people are sinners, like Hester. 7. Neither Hester nor the narrator understands her new perceptions. Ironically, as readers, we do: they are real and true. We share the implied viewpoint of the author. Based on our viewpoint, what can we say the scarlet letter has done for Hester? Our viewpoint, shared with the author, enables us to see that her perceptions are accurate. Thus we know that, by showing her that her sinfulness is in no way unique, the letter has given her insight into human nature. It has deepened her emotional maturity and created a sympathetic bond between her and her fellow sinners. As we shall see in the analysis of excerpt 3, this bond will be an important element in her reintegration into the Puritan community. Walking to and fro, with those lonely footsteps, in the little world with which she was outwardly connected, it now and then appeared to Hester, — if altogether fancy, it was nevertheless too potent to be resisted, — she felt or fancied, then, that the scarlet letter had endowed her with a new sense. She shuddered to believe, yet could not help believing, that it gave her a sympathetic knowledge of the hidden sin in other hearts. She was terror-stricken by the revelations that were thus made. What were they? Could they be other than the insidious whispers of the bad angel [Satan], who would fain have persuaded the struggling woman, as yet only half his victim, that the outward guise of purity was but a lie, and that, if truth were everywhere to be shown, a scarlet letter would blaze forth on many a bosom besides Hester Prynne’s? Or, must she receive those intimations — so obscure, yet so distinct — as truth? In all her miserable experience, there was nothing else so awful and so loathsome as this sense. It perplexed, as well as shocked her, by the irreverent inopportuneness of the occasions that brought it into vivid action. Sometimes, the red infamy upon her breast would give a sympathetic throb, as she passed near a venerable minister or magistrate, the model of piety and justice, to whom that age of antique reverence looked up, as to a mortal man in fellowship with angels. “What evil thing is at hand?” would Hester say to herself. Lifting her reluctant eyes, there would be nothing human within the scope of view, save the form of this earthly saint! Again, a mystic sisterhood would contumaciously assert itself, as she met the sanctified frown of some matron, who, according to the rumor of all tongues, had kept cold snow within her bosom throughout life. That unsunned snow in the matron’s bosom, and the burning shame on Hester Prynne’s, — what had the two in common? Or, once more, the electric thrill would give her warning, — “Behold, Hester, here is a companion!” — and, looking up, she would detect the eyes of a young maiden glancing at the scarlet letter, shyly and aside, and quickly averted, with a faint, chill crimson in her cheeks; as if her purity were somewhat sullied by that momentary glance. O Fiend, whose talisman was that fatal symbol, wouldst thou leave nothing, whether in youth or age, for this poor sinner to revere? — Such loss of faith is ever one of the saddest results of sin. Be it accepted as a proof that all was not corrupt in this poor victim of her own frailty, and man’s hard law, that Hester Prynne yet struggled to believe that no fellow-mortal was guilty like herself. 8. In the first sentence the narrator explains that Hester’s position in society rather than the actual letter itself had a “powerful and peculiar” effect on her mind. How would you characterize her position in the society of Boston? She is an outcast, forced to exist on the margin of Boston society. She is alone, aware that she cannot depend on her neighbors and aware, too, that she will never again be fully a part of her community. 9. What does the narrator mean when he says Hester “cast away the fragment of a broken chain”? He means that Hester wants no connection with the society that has exiled her. The connection, the “chain,” is broken, and she wants no vestige, no “fragment,” of it in her life. She has declared her independence from Puritan society. 10. How has Hester’s position in society affected her? It has caused her emotional life to wane and her intellectual life to become more vigorous. 11. How would you characterize Hester’s new intellectual life? 12. The story is set in the 1640s. Thus when the narrator refers to the bold, speculative, revolutionary age whose spirit comes to Hester from “the other side of the Atlantic,” he is referring to such developments as the works of French philosopher Rene Descartes, published in the 1630s and 40s, that shook the foundations of Western thought, and the advancement of the scientific revolution begun in the early decades of the 1600s that challenged God-centered explanations of natural phenomena. Why would the Puritan forefathers have considered speculating on the ideas of such an age “a deadlier crime” than adultery? Adultery strikes at the social and moral order of the Puritan community, which is serious enough. However, the wide-ranging, speculative thought in which Hester engages questions “the whole system of ancient prejudice [and]… principle.” In other words, it challenges the very intellectual and theological foundations of Puritan society, a far more grave threat to authority than sexual transgressions. Moreover, adultery can be discovered, especially if a child results from the relationship, and so can be dealt with publicly. Heretical thought, on the other hand, is a private “sin,” easily hidden, and insidious in the “damage” it can do faith. 13. The narrator does not judge Hester’s intellectual rebellion. He simply tells us that it would place her in danger if it were known to her neighbors. How are we as readers to understand Hester’s new way of thinking? Is it sinful? Hawthorne’s portrayal of Puritan society is decidedly unsympathetic. Thus nearly anything that would deliver one of its victims from its oppressive orthodoxy is to be welcomed. Hester’s intellectual liberation is not a sin. It is a triumph. 14. On the basis of this passage, what has the scarlet A done for Hester? By placing her in lonely isolation beyond the purview of the enforcers of orthodoxy, the letter has opened for her the intellectual space she needs to liberate her mind and transcend the oppressive world view of Puritan New England. As we shall see in the analysis of excerpt 3, this critical perspective will also be an element in her integration into the Puritan community. The effect of the symbol — or rather, of the position in respect to society that was indicated by it — on the mind of Hester Prynne herself, was powerful and peculiar. Much of the marble coldness of Hester’s impression [the way she appeared to others] was to be attributed to the circumstance that her life had turned, in a great measure, from passion and feeling, to thought. Standing alone in the world, — alone, as to any dependence on society, and with little Pearl to be guided and protected, — alone, and hopeless of retrieving her position, even had she not scorned to consider it desirable, — she cast away the fragment of a broken chain. The world’s law was no law for her mind. It was an age in which the human intellect, newly emancipated, had taken a more active and a wider range than for many centuries before. Men of the sword had overthrown nobles and kings. Men bolder than these had overthrown and rearranged — not actually, but within the sphere of theory, which was their most real abode — the whole system of ancient prejudice, wherewith was linked much of ancient principle. Hester Prynne imbibed this spirit. She assumed a freedom of speculation, then common enough on the other side of the Atlantic, but which our forefathers, had they known of it, would have held to be a deadlier crime than that stigmatized by the scarlet letter. In her lonesome cottage, by the sea-shore, thoughts visited her, such as dared to enter no other dwelling in New England; shadowy guests, that would have been as perilous as demons to their entertainer, could they have been seen so much as knocking at her door. 15. How does the meaning of the scarlet A change? Instead of being a “stigma,” inspiring “scorn and bitterness,” it becomes a “type” or symbol of “awe” and “reverence.” In other words the A goes from being something negative to something positive. 16. Why does the meaning of the letter change? The exemplary life Hester leads changes the community’s attitude toward her and, in turn, its perception of the scarlet A. The narrator describes this transformation in chapter XIII, “Another View of Hester,” in which he notes that she made no claims upon the community, ie. was “self-devoted,” and ministered to those in need, ie. was “toilsome.” In the eyes of the community, her behavior changes the letter from a “token… of… sin” to a symbol of her “good deeds.” Presumably, she resumes her good deeds upon her return to Boston. 17. Why do her neighbors seek her comfort and counsel when afflicted with “sorrows and perplexities”? 18. Why would women be especially inclined to confide in her? She, like them, has endured the “trials of wounded, wasted, wronged, misplaced, or erring and sinful passion.” Her heart, too, has been “unyielded,” given in requited love. Again, they sense a sympathetic bond with her. 19. The sympathy and understanding her neighbors find in her bring them to her door and make her part of the community once again. In what way is this reintegration attributable to the scarlet A? As we noted in our analysis of excerpt 1, the letter endows her with a sympathetic understanding of the failings of others, and it is that understanding that causes her neighbors to embrace her. 20. In addition to emotional comfort, Hester offers the women who come to her a vision of a new social order that will rearrange relationships between men and women to the benefit of both. In what way is this new vision attributable to the scarlet A? To develop that vision, Hester needed the intellectual space to critique Puritan society and to imagine another, more liberated way to live. As we noted in our analysis of excerpt 2, the isolation the letter imposed on her gave her that space and allowed her to transcend the orthodoxy of Puritan New England. 21. How has the scarlet A functioned as the agent of Hester’s inclusion into Puritan Boston, and why is that function ironic? The scarlet letter makes it possible for her to achieve the emotional and intellectual depth that creates a role for herself within the Puritan community. While she still lives physically on Boston’s fringe, the letter has, in a sense, stretched the town’s boundary to include her isolated cottage. Its function is ironic because it was intended to mark her as one to be shunned and exiled. But there was a more real life for Hester Prynne, here, in New England…. Here had been her sin; here, her sorrow; and here was yet to be her penitence. She had returned, therefore, and resumed, — of her own free will, for not the sternest magistrate of that iron period would have imposed it, — resumed the symbol of which we have related so dark a tale. Never afterwards did it quit her bosom. But, in the lapse of the toilsome, thoughtful, and self-devoted years that made up Hester’s life, the scarlet letter ceased to be a stigma which attracted the world’s scorn and bitterness, and became a type of something to be sorrowed over, and looked upon with awe, yet with reverence too. And, as Hester Prynne had no selfish ends, nor lived in any measure for her own profit and enjoyment, people brought all their sorrows and perplexities, and besought her counsel, as one who had herself gone through a mighty trouble. Women, more especially, — in the continually recurring trials of wounded, wasted, wronged, misplaced, or erring and sinful passion, — or with the dreary burden of a heart unyielded, because unvalued and unsought, — came to Hester’s cottage, demanding why they were so wretched, and what the remedy! Hester comforted and counselled them, as best she might. She assured them, too, of her firm belief, that, at some brighter period, when the world should have grown ripe for it, in Heaven’s own time, a new truth would be revealed, in order to establish the whole relation between man and woman on a surer ground of mutual happiness. Earlier in life, Hester had vainly imagined that she herself might be the destined prophetess, but had long since recognized the impossibility that any mission of divine and mysterious truth should be confided to a woman stained with sin, bowed down with shame, or even burdened with a life-long sorrow. The angel and apostle of the coming revelation must be a woman, indeed, but lofty, pure, and beautiful; and wise; moreover, not through dusky grief, but the ethereal medium of joy; and showing how sacred love should make us happy, by the truest test of a life successful to such an end! As we have seen in The Scarlet Letter, seventeenth-century Puritan New England enforced private morality through public shaming. We might think that such punishment is a thing of the past, but, in fact, public shaming has been making a comeback in recent years. In 2013, for example, a judge in Cleveland, Ohio, sentenced a man who threatened two police officers to stand on a street corner several hours a day with a sign around his neck that not only apologized to the policemen but also proclaimed the man to be an idiot. Judges who have doled out such punishments argue that they are an efficient and inexpensive way to deal with low-level crime. Critics maintain that they do not address the causes of criminal behavior. Do you think public shaming should become a standard punishment for lawbreakers in our society? Write an essay defending your position.